We pride ourselves on providing a fantastic service and an amazing product range. Take a look at what our customers say! Through an emergency loan of a Safespaces Voyager from Newlife, Mason is now able to feel safe and secure to rest and drift off to sleep and showing positive signs at school and at home in family life. Read the Emma and Mason’s story in full here. Dexter and Helen’s Safespace journey with their Voyager loan from Newlife The Childrens Charity was also featured in the Sussex Express and Kent and Sussex Courier in December 2018. I just wanted to say what a pleasure it was to meet Andy to discuss Joseph’s Safespace bed. Andy was informative, helpful, friendly and provided the kind of wonderful customer service that sadly seems to be in short supply elsewhere. Please pass on my thanks to Andy and all at the Safespace team. Once again, thank you from Joseph and I for a great experience and I think it is wholly appropriate to give credit where it’s due. Especially when you receive such an outstanding service. I am extremely happy with the Safespace room. My son now has somewhere safe to go if he has a full melt down. Somewhere he cannot hurt himself or others and he loves being in it. At night time he gets more sleep and we have the peace of mind that he is safe in his room. We are all getting more sleep as a result of having the Safespace room. Ella’s Cosyfit HiLo was her first proper bed. Previously, Ella had been in cots/travelcots as she has hypermobility and a tendency to bathe herself in milk. As the cots became unsuitable, luckily enough for us we were told about Safespaces and the help they provide in getting many items of equipment including the Cosyfit HiLo. The Cosyfit HiLo has been brilliant for Ella. Her transition into it was great. Ella still likes to bathe herself but with the materials the bed is made from, it is much easier to clean than cots. Sometimes I turn Ella’s bed into a ballpit for her and she loves it! Our son Oliver, 7, has been diagnosed with autism, sensory processing disorder, ADHD and a severe learning disability. We would have to sit with him as he would get in and out of the bed and didn’t understand it was bedtime. We would do this because he would jump around and slam himself down. He throws himself around to get pressure on his skin as he likes that contact. It was a big worry for us because he could hit the wall or hit his head. He would cry himself to sleep. He would then wake up at 2am and would be up for the rest of the day – which was really exhausting. 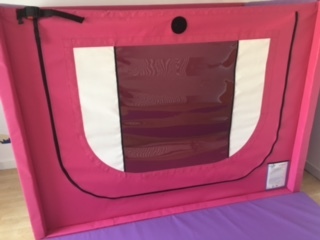 We were told about this Safespace bed…A few parents had used it and said it helped their child. It is similar to a travel cot but the sides go all the way round. He hasn’t cried himself to sleep since he got his new bed, even if he jumps around he can’t hurt himself and there are no sharp edges. If he does wake up in the night he goes back to sleep, which is like a miracle as he has never been able to do that before. It has changed our family’s life and made a huge difference. People don’t quite know how difficult it is raising a child with autism until you live it. We’ve had a Safespace for 3 years now for my son. It’s been fantastic with no problems. We are now looking into having a Voyager or Voyager Compact now too, for overnight respite care. “I really do feel the need to write to you and say the biggest THANK YOU I have ever said. I have had a Safespace fitted for just 2 weeks and already it has changed our lives. The service I have received from your company from consultation (I had many many questions) to design and fitting were all exemplary. My son is 26 years old with the development delay of a child under 1. He has severe epilepsy and behaviours that challenge on an exceptional level. He has rarely had an undisturbed night and has for the first time in his life slept soundly throughout the night…not just 1 night but so far 5 nights in a row!!! You can imagine that this had had an amazing effect on his mood, his behaviour and his epilepsy. Needless to say the effect on us (his parents) had been phenomenal….we feel human. “Really happy with this purchase. The bed fits perfectly, my daughter is safe and happy when she’s in it. Delivery was on time and the customer service is attentive – even a follow up call to check that we were happy.” – Feedback via Domodep, one of our distributors in France. “Safespaces cut out many sensory impressions that otherwise overwhelm and arouse our pupils. Being in a Safespace helps the child to relax, reduce their anxiety & promotes a feeling of safety. For one of our pupils the Safespace is one of the few places he is actually safe at night. The Safespace means that he is unable to access any plugs, radiators or other objects that he might use inappropriately. This has meant that he now sleeps between 8 and 9 hours a night & no longer engages in risky daytime behaviour. For some of our pupils who engage in self injurious behaviour the Safespace provides a truly safe space. The Safespace limits any sensory feedback as well as preventing any harm to the pupil so this quickly promotes a de-escalation and keeps both the pupil and staff safe. 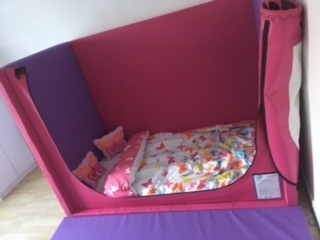 We have had our staff as well as members of my family sleep in Safespaces and all have enjoyed it saying that it provides a lovely cosy sleeping environment”. “We use the Safespaces for a number of purposes, it very much depends on the needs of the children. 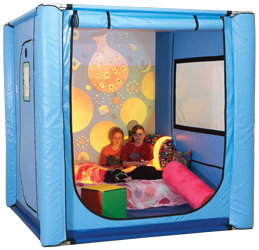 Some children have used the Safespace for child initiated time out, which helps them to regulate their own behaviours, some for a sensory experience, with resources added to meet needs, some as a calming space, which can offer a private space if upset/cooling down and some as a space to undertake one to one work. “He loves it and now even asks to go to bed. The impact on both our lives has been immeasurable! “Sam has enjoyed the safespace over the years. It has kept him and the rest of the family safe when his challenges were difficult! “Amazing. When my daughter wakes up in the night she self soothes and gets herself back to sleep, whereas that did not happen before. She is also more settled”. “The Safespace is amazing. Lewis is happy to go to bed and he settles himself. It is also peace of mind for myself that Lewis cannot come into any harm from hard objects. The bed itself is very well made and the fittings are very very secure and thankfully it is very easy to clean off all the mess Lewis makes without affecting the quality of the bed”. “We currently have 2 Safespaces at school and they are used throughout the day by many students for a range of purposes. The main use is for time away to help with self -regulation- this is usually a choice made by the student, sometimes they are directed to go there for some time. Once in the Safespace the students calm quickly. Students with Sensory needs use the Safespaces for Sensory activities throughout the day, sometimes with mats and other OT equipment, however some students use the walls in the space to get feedback from when they push against them. Using Safespace has helped to improve behaviour across the school- limiting the need for restrictive physical interventions. It helps the students to be in control of their behaviour as they know they have the choice to go somewhere and let off steam safely without the need for adult intervention. This is particularly useful with our students who are on the Autism spectrum with severe learning and sensory processing difficulties. We would consider more Safespaces in the future as we have many students requiring quiet time away from their peers in a safe place”. I would like to personally thank you for your highly professional and flexible approach in resolving this. By pulling together we were able to reunite a distressed child with his family. Amy’s only just came home from school and her voice has shown how happy she truly is. She has been enjoying exploring the new Cosyfit and is so happy. Happy New Year ! Here is a brief update to let you know how Hannah is doing.I wanted to let you see that the Safespace is still working for Hannah and how it has really helped with her night time routine. This has barely changed over the years and Hannah very rarely objects to going to bed at bed time. She is usually very keen to go and will even let us know in her own way if she wants to go to bed early. She still finds the Safespace a calm and relaxing place to be. If she wakes in the night she will usually chat to herself – and we continue to have peace of mind knowing that she is safe. It’s hard to believe that it’s over 14 years since Hannah got her Safespace. I confess we now take it for granted but I don’t like to think how things may have turned out for us without it. Click here to watch the film of Hannah 6 years after it was installed. I visited my client today which reminded me to contact you to say a big thank you to you and your colleagues at Safespace. He is really settled back at home, is in a better sleep routine, and is sleeping through the night. The Community Learning Disability Nurse was with me today and we were remarking that the bed is really working for D. We acknowledged it was early days and no doubt his behaviours will change but for now he is enjoying a very settled time at home and the Safespace is very much part of his care plan. My grandson Thomas is doing really well and thinks he is the king of the castle with his Safespace. He will take himself to his Safespace whenever he wants to. The technicians that came were polite and courteous. They were lovely boys and cleaned up behind themselves. I would recommend Safespaces both for products and staff. Our Safespace got installed today, we just want to say a hugeeeeee thank you ! And this will help us so much …. thank you. We are delighted with the Safespace Voyager Compact that we have. It has made a huge difference when Jack stays with us for a few days each week. He now has his own lovely comfy bed and is safe. I just wanted to drop you a quick email to say a very big thank you for the delivery and erection of George’s new Safespace. The gentlemen who came to deliver and erect it were so friendly, helpful and knowledgeable about the product and obviously love their job. As soon as George saw it he went and got his quilt, pillow & comforter and put them in ready for tonight. I’m sure that we will have as much success as we have had with The Voyager which has been a life saver over the past few months and transformed our holiday this year. The Safespace is the best thing ever and Freddie loves it. Bedtime is a much happier time for us all. The family sleeps much better knowing that Freddie is safe and secure. He is unable to bang on the walls and life has improved for the neighbours also. The process was so easy from start to finish. The service was quick, speedy and easy with lots of discussion around the family requirements. We received funding from Newlife and would also like to thank them. Our Safespace has changed our lives and has had an impact on everyone in the family. Danny has a safe area in the home that he feels safe and calm, he loves his Safespace and knows this is his den and others need to gain his permission to enter. We are also experiencing less melt downs. His brothers were able to sleep better at night, especially whilst going through exams at school and I am able to relax and sleep better knowing Danny is safe all night. The Safespace is also every easy to clean and dry. I also recommend having the white wall on the back, this will be better for projectors, again this has a calming effect on Danny. The staff at Safespace are so friendly and helpful when ever I have had to call for advise and has been a pleasure to meet. When we wanted to re-carpet the room, the staff that came out were very helpful when they came out to move the Safespace. This is more then a bed, this is a necessity for anyone with autism. Thank you again for giving us our lives back!! We are currently using our Safespace as (a) a chill-out room/calm down space for children who present with challenging behaviours, (b) a therapy and sensory space , (c) a cushioned are where children can make themselves comfortable and share a story with a grown-up. Although only in it’s infancy at Old Town, the Safespace is already having a positive impact on many of our children. The service we received was super and there was regular communication throughout the designing process to ensure that the bespoke Safespace was tailored to the exact specifications of our chosen space within school. The installation team were extremely professional and hard working in building the Safespace – in fact they were only on site for a minimal amount of time. We are extremely grateful to all of the Safespace team for all of their hard work and for making the design and installation so easy”. The Voyager is fantastic for us as a family. All the family are sleeping better knowing our son is safe at night. Our son was very ill recently and had to stay in hospital he was unsettled until we took the Voyager into hospital for him, he was able to feel safe secure and calm. This is a life changer for us and I am amazed at how much better family life is. Our daughter Gracie would not have been able to attend her residential school without her Safespace Hi-Lo. Newlife received these lovely photos of Thomas in his new Cosyfit bed which has made a huge difference! The Safespace has helped George’s bedtime routine. Prior to the Safespace I would have to settle George which took anything from one to three hours & sometimes failed altogether! Whilst I was settling George upstairs it left my older daughter Lucy (13) downstairs on her own for long periods of time. However, with the Safespace, bedtime is a very different experience! We can put on the sensory equipment & just sit quietly next to George & hold his hand & he will generally fall asleep within 30-45 minutes snuggled up in a relaxing, calm & safe environment. In the three short months we have had the Safespace we have seen huge improvements with George & our whole family. George settles much better & is increasing his independence at bedtime. The Cosyfit Hi-Lo allows us to support families with a child with very complex needs. It provides reassurance to families that we can provide a safe environment for the child. Before we had the use of the Cosyfit Hi-Lo we were not be able to provide safe care for some children, and had to cancel surgery for a couple of times. Now we use Safespaces rental service to have the Cosyfit Hi-Lo delivered when required. We now no longer have to crisis manage after the children have arrived on the ward, but can plan for their admission.